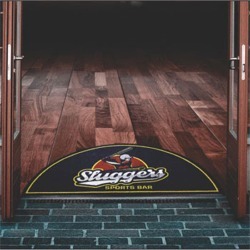 Our indoor logo mats are made with nylon carpet face with rubber or vinyl backing. 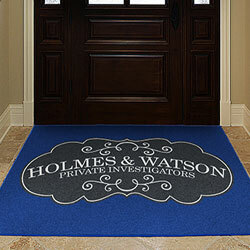 These custom rugs are use mainly for indoor entrances and recessed areas with medium to heavy foot traffic. All our indoor mats are dye printed and have unlimited logo colors available. Please select below to view prices and Request your FREE digital proof. 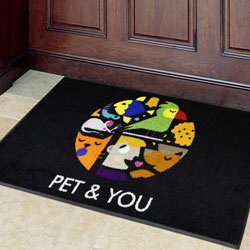 Printed nylon carpet rugs achieved on digital printer. Colors are dyed. For high traffic use. Rubber backing and borders. 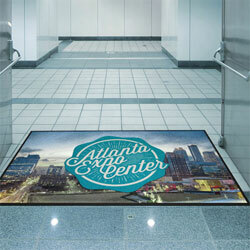 High Definition printing using a more dense carpet for better and finer details. High traffic use. Rubber backing and edges. Same High Definition printing but with surged edges and vinyl backing. Nice plush carpet for use in medium traffic areas. Custom Shape Carpet. High Definition digital printing. Heavy traffic use. Rubber backing and borders.